As part of the University’s effort to encourage and support students who are at the writing stage of their theses and want to get papers published in Journals listed in ISI Web of Science [Thomson Reuters) and Scopus, the School of Postgraduate Studies of University of Nigeria, in collaboration with the Demography and Population Studies Programme, University of the Witwatersrand, Johannesburg, South Africa, and JECedit SE Lund, Sweden will be organizing the 2nd edition of a three-day Advanced PhD/Research Paper writing workshop for Staff/ PhD students at the writing stage of their theses. 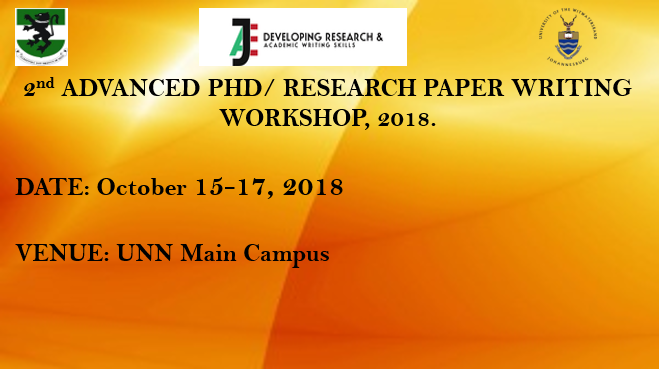 During the workshop, Staff/PhD students, who are writing up their theses or would want to extract papers from their theses, will focus exclusively on writing skills and publication processes. Experienced discipline-based facilitators will be available to guide the students and review write-ups to be produced by the participants. Potential Outcomes: Completion of PhD Thesis; Translating PhD theses to publishable manuscripts; preparing for Special Journal Volumes and Publishing of completed manuscripts in credible Journals. If you have a draft manuscript, please forward it to: chukwuedozie.ajaero@unn.edu.ng on or before Wednesday 10th October 2018. The manuscripts will be sorted out by Faculties. Please note this Workshop will be intensive and can only accommodate early career researchers and students with draft manuscripts.